Photo shown here shows the Tactical Leather Dog collar as 1.5" wide, with pink on black leather, fuchsia and black jewels, nickle hardware, and a tapered buckle end. Stone Colors only come in 1/2" size so if you select 2 stone colors it will alter the design and may not be aesthetically pleasing. If you only select 1 stone color and 1 jewel color we would make the larger in the patter the stone color and the smaller the jewel color. PLEASE NOTE: Please specify in comments at checkout which jewel color you'd like to be the larger center color, and which the smaller jewels. If this is not specified at checkout we will make the decision for you based on your color selections. Taper: Please see the image below for a visual. A taper is applied to the buckle end which reduces the over all buckle size and bulk. A tapered buckle end comes standard as a 1/2" less width than the overall collar. If you prefer it to be even less width please make sure to note it in the comments during your checkout. Dedicated Tag Loop: All of our collars come with D-Rings and strap keepers. 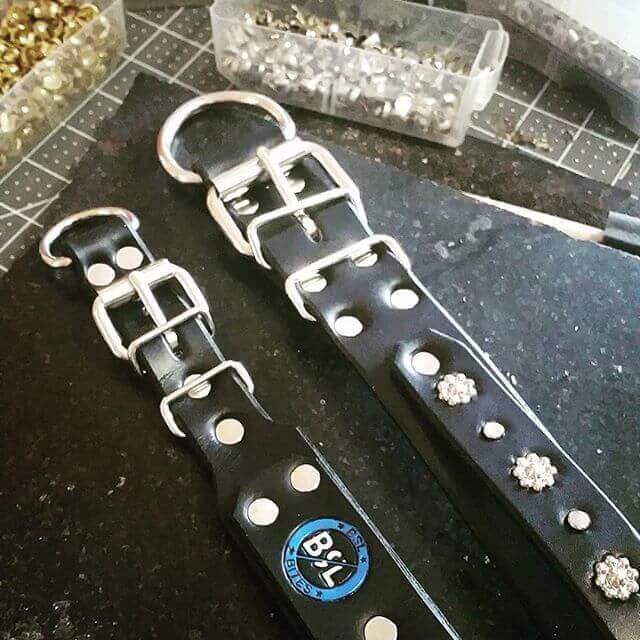 We now offer the option to add a dedicated smaller D ring that is dedicated to carry your pups tags.